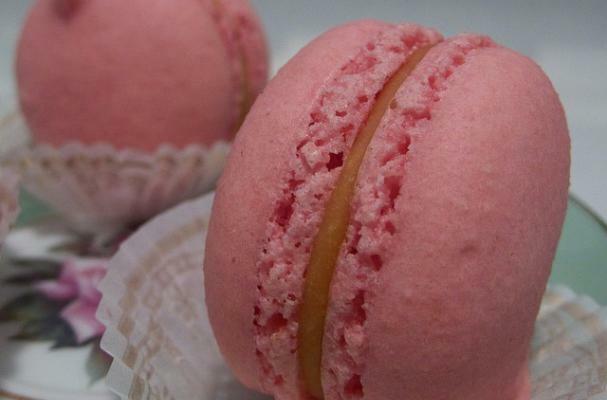 Macarons are a delicate French cookie that are absolutely delicious. You can make them in a million flavors like lavender, green tea, chocolate, or even rose. These days, you can find these rainbow colored cookies in any good bakery or French patisserie. These peppermint macarons are perfect to munch on during the holiday season. I won't pretend that these beauties are easy to make but with some due diligence, anything is possible. My advice- be patient and follow directions. These pretty peppermint macarons are best devoured in a comfy chair with a steaming mug of hot chocolate. Preheat the oven to 350 degrees. In a medium bowl, whisk together confectioners' sugar and ground almonds. In a separate bowl or in an electric mixer, whip egg whites with salt until foamy. Increase speed and gradually add granulated sugar. Continue to whip until stiff peaks form. With a spatula, gently fold in the confectioners' sugar mixture, extract, and a few drops of red food coloring until pink until completely incorporated. Line baking sheets with parchment paper or non-stick mats. If using parchment, you can outline the circles so that the cookies are more evenly sized. Fit a pastry bag with a 3/8-inch #4 round tip, and fill with batter. Pipe 1-inch disks onto prepared baking sheets, leaving 2 inches between cookies (do not worry if the batter spread a little). Let stand at room temperature until dry, and a soft skin forms on the tops of the macarons about 15 minutes. Bake for 15 minutes, with the door of the oven slightly ajar, until the surface of the macarons are completely dry. Remove baking sheet to a wire rack and let them cool completely on the baking sheet. Gently peel the cookies off the parchment. Macarons are fragile so be careful when removing from parchment. Once cooled, make ganache. Melt chocolate and cream together in the bowl of a double boiler, stirring to combine. Cool slightly. Pour in a pastry bag and snip off end. Fill macarons and sandwich together. Wow, these look delicious! Who knew you could make your own?